Gorkha Exim has been engaged in marketing of Ayurveda health products, herbal nutritional supplements and essential oils from last 25 years . Our products are of highest quality and highly demanded in Nepal as well as the countries around the world including Czech Republic, France, Germany, Italy, Latvia, Sweden, UK and the USA. The quality of our products is reflected in the ever increasing demand from our long standing customers around the world. One of our major products is SHILAJIT. 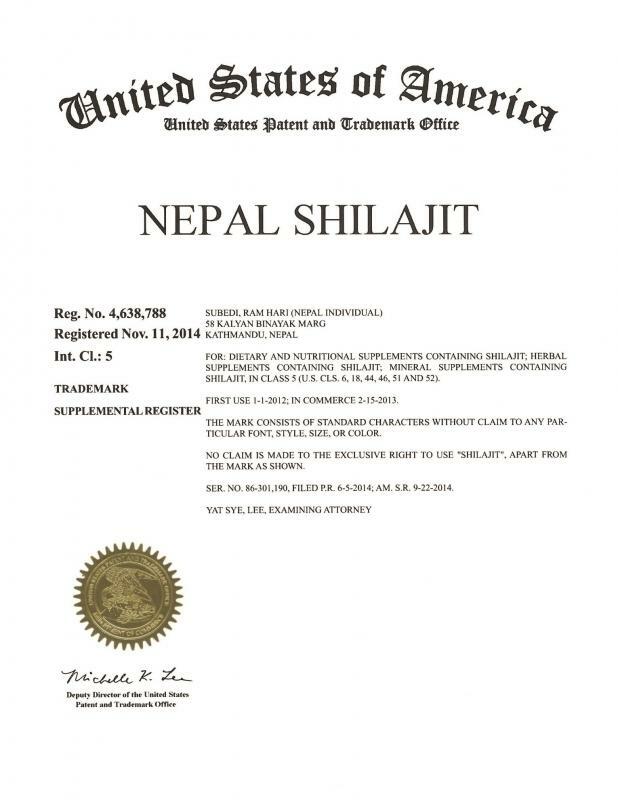 We are proud to mention that we have obtained trademark ” NEPAL SHILAJIT” from United States Patent and Trademark Office (USPTO). SHILAJIT is an age old anti aging, immune modulator that is found in Nepal and also in few other countries but the source of the highest quality Shilajit is considered to be of Nepal Himalayas where the people are involved in collection, purification and use of Shilajit from time immemorial. Shilajit found in Nepal matches the description of ancient Ayurvedic text “Charaka”. Shilajit has been used for longevity and treat a variety of diseases in Ayurveda. In Charaka(200 BC) and Susruta Samhita (200 AD), Shilajit has been described as RASAYANA (rejuvenative) that can cure all ailments and prolongs the life. Nepal Shilajit with age-old Ayurveda wisdom brings you health and longevity by offering high quality authentic Shilajit at affordable prices.